Aim To explore the variation in hospital admission rates and duration of inpatient stay across England. Methods Hospital Episode Statistics were used to identify all children aged below 2 years who were discharged from hospital with a primary code of bronchiolitis in England, between 1 April 2007 and 31 March 2010; rates of admission and duration of stay were analysed by Primary Care Trust (PCT). Results There were a total of 75 318 admissions for bronchiolitis in England in children under 2 years old during the study period. There was a 15-fold variation across PCTs in England in the admission rate for bronchiolitis (351–5140 admissions per 100 000; coefficient of variation (CV)=0.43) and a sixfold variation in the mean duration of stay in days for children with bronchiolitis (0.7–4.1 days in hospital; CV=0.27). Duration of stay was not correlated with socioeconomic deprivation, while admission rates showed variation even among PCTs of similar socioeconomic profile. Conclusions We postulate that healthcare provider factors manifested by variation in clinical decision-making (including thresholds for admission and discharge, and variation in therapies) are responsible at least in part for variation in rate of admission and length of stay for children with bronchiolitis in England. Bronchiolitis places a high burden on healthcare services, and admission to hospital has major implications for patients, families and carers. There is seasonal variation in the rate of admission and length of stay for bronchiolitis. Small single centre studies do not seem to report a great deal of variation in rate or duration of hospital admission for bronchiolitis. There is significant variation across populations (defined by Primary Care Trust) in England in rate and duration of admission for bronchiolitis. Correlation of both indicators with socioeconomic deprivation is weak or absent, suggesting other factors are at play. The objective of this study was to explore the variation in hospital admission rates and length of stay (LOS) for bronchiolitis across England. Data were analysed by population rather than by individual hospital providers, in order to account for the effect of the whole local healthcare system (primary care, community and hospital services) on hospital admission and discharge patterns. Hospital Episode Statistics (HES) were used to identify all children aged below 2 years who were discharged from hospital with a primary code of bronchiolitis (ICD-10:J21) in England, between 1 April 2007 and 31 March 2010 (http://www.who.int/classifications/icd/en/). The chosen population boundary by which to analyse the data was the Primary Care Trust (PCT). The population of each PCT is served by a single commissioning body, which has sole responsibility for healthcare provision for that population. Analysis by commissioning boundaries allows more meaningful analysis in terms of outcomes for that population, and reduces the impact on data analysis of local healthcare system factors such as idiosyncrasies in referral patterns or in the practice of individual hospital providers. HES entries for individual patients were linked to PCT by general practitioner registration. Admission rates were calculated per 100 000 children aged under 2 years in each PCT. Mean LOS (by whole day) was calculated for total admissions in each PCT. All data were standardised by population of children under 2 years in each PCT using figures from the Office for National Statistics. The degree of variation is presented as the coefficient of variation (CV) (ie, (SD)/(mean)), which quantifies the variation of the mean measured rate from the norm (ie, a CV of 0.10 would show that a PCT's average rate is 10% above or below the national average rate). The Spearman's rank correlation (r, ranging from 0 to ±1) was used to elicit the effect of socioeconomic deprivation on admission rates and LOS using the Indices of Multiple Deprivations 2010 (IMD 2010) value (http://www.communities.gov.uk/documents/statistics/pdf/1871208.pdf), a composite figure for average level of multiple deprivations within each PCT. In the 3-year period, there were a total of 75 318 admissions in children under 2 years old for bronchiolitis (ICD-10:J21) across all 152 PCTs in England. There was a 15-fold variation across PCTs in England in the admission rate for bronchiolitis (351–5140 admissions per 100 000 children aged under 2 years; CV=0.43) (figure 1). There was a sixfold variation across PCTs in England in LOS for children with bronchiolitis (0.7–4.1 days; CV=0.27) (figure 2). 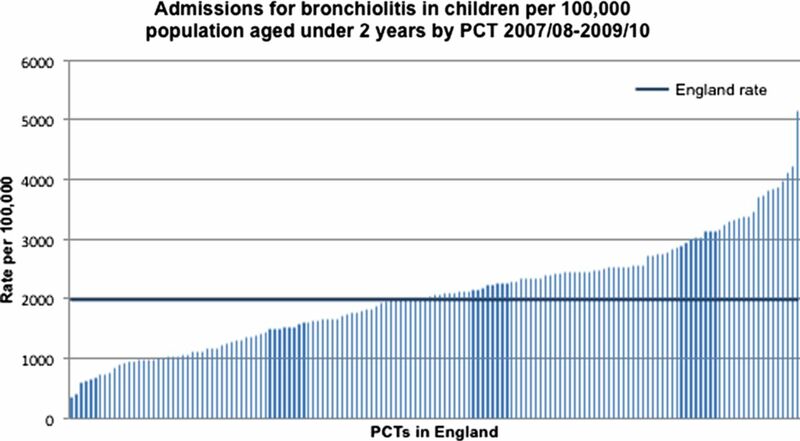 Admissions for bronchiolitis in children per 100 000 population aged under 2 years by Primary Care Trust (PCT) in England, 2007/2008–2009/2010. Mean length of stay for bronchiolitis admissions for children aged under 2 years by Primary Care Trust (PCT) in England, 2007/2008–2009/2010. Rates of hospital admission by PCT were positively correlated with socioeconomic deprivation as measured by IMD2010 values (r=0.332, p<0.0001) (figure 3). LOS showed no correlation with socioeconomic deprivation (IMD 2010) by PCT (r=0.129, p=0.114). 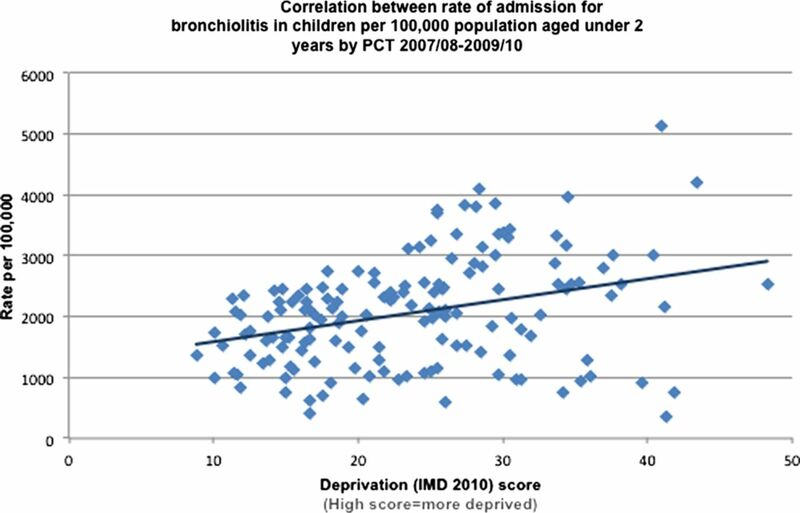 Correlation between rate of admission for bronchiolitis in children per 100 000 population aged under 2 years by Primary Care Trust (PCT) in England, 2007/2008–2009/2010. There is significant variation in the rates of admission and LOS for infants with bronchiolitis across England. Much of the literature on bronchiolitis has shown that incidence and severity of illness correlate positively with measures of socioeconomic deprivation. A recent report suggests that it is the link between multiple deprivations and household smoking that drives this, rather than deprivation per se.3 Our findings mirror this, with LOS showing no correlation with deprivation, suggesting that the sixfold variation is likely to be associated with other factors. Although admission rates were positively correlated with deprivation, the correlation is modest (r=0.332, p<0.0001). In particular, on interrogating the data for the PCTs at either extreme of deprivation, we find considerable variation even among PCTs of similar socioeconomic profile. The magnitude of variation is over 15-fold even among the 10 most deprived PCTs (range 351.5–5139.6 admissions per 100 000 children, CV=0.62) and threefold among the 10 least deprived (range 838.9–2297.5 admissions per 100 000 children, CV=0.35). Based on these data, socioeconomic deprivation alone does not account for the magnitude of variation shown. Other factors known to affect incidence and severity of bronchiolitis include premature birth, low birth weight, low admission weight, young age and household smoking.3 Of these, only young age is not correlated with socioeconomic deprivation, but it is extremely unlikely that, over the 3-year study period, there would be significant variation among PCTs of age range for children below the age of 2 years. Other factors must therefore be influencing the variation in rates of admission and LOS. Variation in clinical management is one likely factor. Evidence already exists to suggest that variation in the threshold for oxygen supplementation and criteria for admission and discharge for bronchiolitis have a significant impact on LOS.4 More broadly, bed capacity in children's inpatient units has been shown to be positively correlated with rates of discharge from hospital.5 In the absence of other explanatory causes, we believe that these healthcare provider factors are likely to contribute to the variation demonstrated. A major limitation to the study is in the quality of the source data. Not only is data coding for HES reportedly inconsistent, it also limits the analysis to whole-day admissions, which may not reflect the trend towards 0-day ‘short-stay ward’ admissions for bronchiolitis. This may partially explain why single-study reports have yielded less dramatic variation in admission rates and duration than we have shown. Additionally, diagnosis can be clinically challenging, particularly in children in the second year of life, which may be another source of variation. Admission rates for asthma and epilepsy in children have also been shown to vary substantially,2 suggesting that variation is likely to be due to both disease-specific care processes and broader system-wide factors. Research into the effect of these factors in the wider context of other paediatric conditions would be an important next step in reducing variation. We speculate that healthcare provider factors manifested by variation in clinical decision-making are responsible at least in part for variation in rates of admission and LOS for children with bronchiolitis in England. These factors are likely to include thresholds for admission and discharge; and variation in therapies. Further research is required to identify which specific factors are having the greatest effect, in order to reduce unnecessary admissions and the burden this places on families, children and the wider healthcare economy. The authors would like to thank NHS QIPP Right Care for help with the methodological concept, and Stephen Chaplin of the Child and Maternal Health Observatory for the extraction and collation of data for analysis. Scottish Intercollegiate Guidelines Network (SIGN). Bronchiolitis in children. A national clinical guideline. 2006. http://www.sign.ac.uk/pdf/sign91.pdf (accessed 27 Oct 2012). NHS Right Care. NHS atlas of variation in healthcare for children and young people—March 2012. 2012. http://www.rightcare.nhs.uk/index.php/atlas/children-and-young-adults/ (accessed 27 Oct 2012).
. Household tobacco smoke and admission weight predict severe bronchiolitis independent of deprivation: prospective cohort study. PloS ONE 2011;6:e22425.
. Impact of a bronchiolitis clinical care pathway on treatment and hospital stay. Eur J Paediatr 2012;171:82732.
. Why are children hospitalized? The role of nonclinical factors in pediatric hospitalizations. Pediatrics 1994;93:896–902. Contributors CRC developed the idea, designed the study and drafted and revised the article. HS, KT and HD designed and implemented the data collection and analysis, and revised the draft article. MGS developed the idea, designed the study revised the draft article, and supervised the study from conception to completion. CRC is the guarantor.